Lake view lot available at Lake McGregor Country Estates! This lot is located on Block 1 Lot 67. The front of the lot is 11.32 meters in width and faces west. The north side is 34.15 meters and the south side is 32.18 meters. The east side faces the lake and measures 14.0 meters. It is just a couple minute walk down to the lake from this lot, and nothing will be built between this lot and the lake. Minimum size for a cottage is 800 square feet for a bungalow, and 1200 square feet for a two story. Potential for a walk-out basement. Water, sewer, natural gas, electrical, and telephone services run to the property line. The annual community association fee for each lot is $2100. This fee covers water, sewer, and garbage services, as well as use of the marina, clubhouse, and boat storage areas. 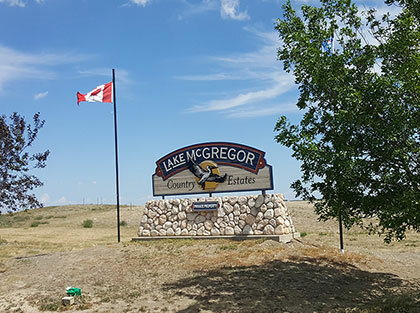 Lake McGregor Country Estates is a four season resort located about 90 minutes SE of the City of Calgary, and 60 minutes north of the City of Lethbridge. Clubhouse has indoor and outdoor pools and more!